Sci-fi film set in the 22nd century. Earth is poor and overpopulated. Rich people live on a space station called Elysium which is a materialist paradise that keeps the poor out. Matt Damon plays Max, a worker who sickens with radiation (having only five days to live) and is implanted with the exoskeleton mind of John Carlyle (William Fichtner) who runs the factory where Max works. Max is up against Delacourt (Jodie Foster) who plans a coup on Elysium with Carlyle. 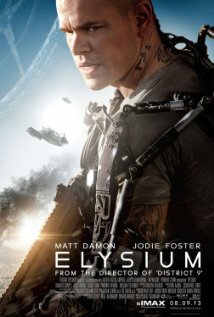 Max is asked to help his girlfriend Frey (Alice Boya) and her sick daughter by gaining access to Elysium’s medical cures. Max battles with Kruger (Sharlto Copley) who is Delacourt’s thug and he must infiltrate Elysium. Will there be a happy ending?